How Can I Repair Inbox.dbx File? DBX is a database file used in Microsoft Outlook Express application to store your important mailboxes. These files are very reliable and used to save important Outlook elements such as emails, contacts, journals, attachments etc; All DBX files have their own file name with extension for example inbox.dbx, sent.dbx, drafts.dbx and so on. Sometimes your inbox.dbx file helps you to hold personal and sensitive data such as credit card records and personal information and any corruption or damage to these files results in many hardships. However to overcome inbox.dbx file corruption many industry experts have designed a wonderful application called "Remo Recover Outlook Express (DBX)". 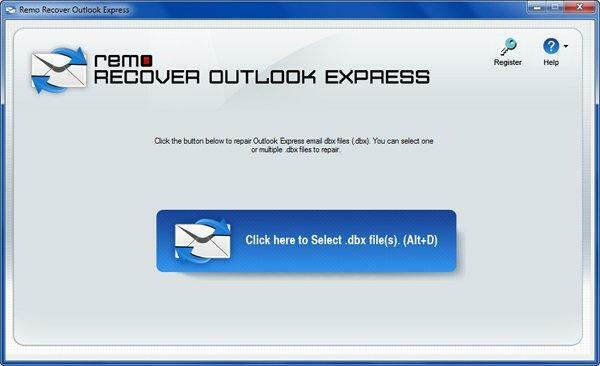 Remo Recover Outlook Express is a safe, effective and result oriented utility that helps users to repair inbox.dbx file with ease. This application repairs .dbx files created on Outlook Express version 4, 5, 5.5 and 6 versions. More to this one can use this tool to recover emails and other Outlook attributes such as notes, contacts, journals, calendar entries etc. Furthermore the tool has the capability to fix DBX files irrespective of its file size. Step 1: Download and install the software to your Windows system. Run the application and specify the inbox.dbx file that you want to repair. Step 2: Next specify the destination path to store your repaired DBX file, set the compression level if required and click on "Ok" tab, to complete repair process.